Alright, I finally did. I actually moved to WordPress and got a domain name for my blog. Can you believe it? I'm finally growing up. So, this is the last post I'll be putting here on Blogger. I've moved everything over to the new blog with a new name: http://www.casualhuntering.com/. I have been wanting to change the name of the blog for a long time now. I mean really "Bob's Casual WoW Hunter Blog", could I make this any longer?? 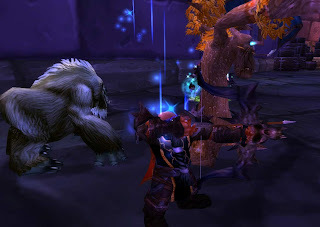 Maybe I should have named the blog, "The Ramblings and Exploits of Bob's Casual Part-Time WoW Gaming Hunter Blog". Now that would have been good. Dang it, I should have bought that domain name, hmmm....www.theramblingsandexploitsofbobscasualparttimewowgaminghunterblogetcetc.com that might hvae been a little cumbersome to type on a regular basis, but it would have stood out. Naw, I like "Casual Huntering" more. Especially since Huntering isn't a real word. Does being a speech language pathologist give me the write to make up new words? Hmmmm. Anyway, come check me out at Casual Huntering, because that's where I'll be hanging out for now on. So, its been spring break so I've had the whole week off. Time to catch up wow, right? Those of you who are married and have children are shaking your head. Nope, actually I've played less WoW this week than I would during a normal work week. Why? Well, I'm sleeping in so I'm not playing a whole lot before the kids wake up (I normally play a little bit in the morning before I go to work), we recently hit level 80 and now my brother wants us to raid/run heroics with him nonstop. Kydra isn't too much into that, would rather just play with her husband (me), and we got reintroduced to how fun our wii is to play. Oh, and I've been reading a book to my wife when we have some free time (I'm reading her New Moon - and no I'm not a big fan, their okay books not amazing books, that's all that I'll say about that). So, I'm kind of in a WoW low right now. I decided to roll characters with my wife on a different server (Feathermoon - Alliance), so that we can play without my guild knowing. That way we can play just ourselves. Any suggestions for our class combination? So, what do you do when you have a vacation from work/school? Do you play more or less WoW? Why? Okay, I have finally went on Naxx for my first time, now that everybody and their dog has already played it too death from what I hear. We did Naxx 10, but we only got through 3 wings of it. We could have done the whole thing, but my little brother was having internet issues and he was kind of our key healer. So, most everybody in the run were kind of over geared for it. Which is nice so someone like me who was very under geared for it could still play. I was a little afraid when I saw 2 other hunters there, but I was told not to worry because they didn't really need anything here anyways. Well, I got like 5 pieces of gear, no joke. Lots of mail stuff kept dropping (a lot of shammy healer stuff too). So, I finally replaced my bow from kara(Sunfury Bow of the Phoenix), replacing it with the Accursed Bow of the Elite. Its about time I replaced that old thing. I probably should go get my hands on a gun (as any good dwarf should do, but hey, I'm kind of use to the bow thing, kind of feel like an elf). I also replaced my melee weapon, my belt, my something or other, hmm, I don't know but, I'm doing much better off now. Wow, its been so long since I have ran an raid. I'm sure I looked like a noob. For one I still had my gorilla (haven't leveled any other pets up yet). I still had my lvl 70 goggles on (I have better, but I like the emote finder capabilities), I had some pretty crappy gear, but if they didn't care then I didn't. At least I didn't cause us to wipe at all (which I did once or twice in Kara). Anywho, I don't know how much raiding I'll actually do. It takes a lot of time that I don't have so I'll keep it to a minimal. I do love raiding with a bunch of friends jokeing about this or that. I don't like it when people take it too seriously. My favorite raid moments were when we were goofing off and just having a good time, not necessarily downing a particularly hard boss. Alright, what have I been doing lately? Well, getting back to my obsession with mounts. I'm currently trying to get my rep up with Cenarian Expedition so I get can get my Cenarian War Hippogryph, which you can get from these guys once you are exaulted. 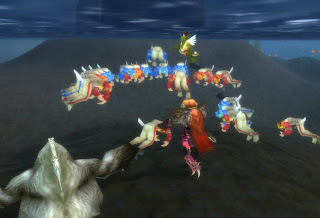 So, one of the easiest ways to get rep with these guys if you are already in Northrend is by cutting off the ears of these scuba divers and taking them over the the D.E.H.T.A. 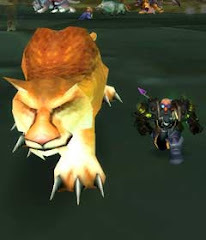 (Druids for the Ethical and Humane Treatment of Animals) for a repeatable quest: Ears of Our Enemies. 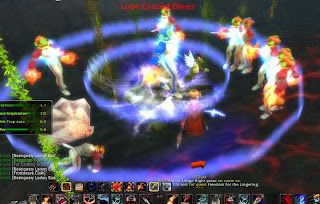 I do think its funny that these druids are all for treating animals ethically, but not scuba divers, well, whatever. As long as I get my Hippogryph. What's really fun is to live out the last of my Gorilla's glory days. A final tribute to the great gorialladine. We like to pull up to 16 of these guys at a time. And yes, I got a little too eager sometimes and pull too many of them at times. Mungula wasn't too happy about that seeing that he died and me to. I guess 20 guys even at level 70 are just too many. Anyway, good times, I only need about 300 more ears to get my rep up. That may sound like a lot, but when you are pulling groups of 15-17 at a time, its really not that bad. We actually use WOW in one of our classrooms. For the students that do want to play, they are learning social skills, math, etc... These are students have disabilities that effect their daily social interactions, such as Autism. They must share a toon.. So there are two students per toon. Their time is restricted... each group is allowed to play for about 1hr a week, though they are able to earn more time if available. It is really a joy to watch a 5th grader and a 12 grader, who never normally would talk to each other, discuss how to do a quest or which items they should keep, use, vendor or AH. For the advance students who play there may be math problems that include % of stats and such. It keeps them engaged and learning. This would not be possible without the amazing teacher that is in that classroom. His success record with these students is 2nd to none. And his ability to see each of their needs and how to reach these through alternative teaching tools is..... He also is a huge advocate in self-control, which is also part of these students' learning. Yes, WOW in the classroom. I really don't think the school district I work for would buy into it, but using WoW as a teaching tool really has a lot of potential. Just think of the reading, math, and problem solving involved in the game. You could teach social skills to children with autism. And there would be some instant motivation. I only wish more admistrators (and parents) would be open minded to something like this. Its actually a very good idea. I know a lot of students that aren't motivated to practice reading, but you have to be able to read to play WoW. My nephew actually started playing before he could read and I'm sure this was a motivation for him. Interesting idea, I've heard of it before at the college level, but never in elementary or high school. Thanks Lytlady! Okay, April Fool's day on the internet has become a "most avoid the internet at all costs" day for me. Its over the top and beyond ridiculous. Okay, I do enjoy some of the stuff. Especially the Bard class that Blizz did last year. I don't even have a clue what's going on this year. Our computer specialist has told us to avoid the internet if all possible. So, I guess I will. Need to do work anyway. Are you planning on doing any april fools jokes on any of your guildies? I'm expecting my mother-in-law to call and tell me someone was in an accident. She does that every year. I think as my april fools joke this year, I'll pretend I completely believe it and have a nervous break down. Oh and I need to call my mother and tell her that we just found out that we're expecting again (we've done that several years in a row, I'm just waiting for the time we really are and she doesn't believe us). Wow, I just read BRK's post about him no longer blogging. It was a moving blog entry and it makes you think about your own life. What is the most important things in our lives, and are we making the most important things the most important. That makes me think about Steven Covey's book First Things First. We often neglect that which is the most important. Of course, we'll miss BRK's blog, I think there are many of us that got into blogging because of him. 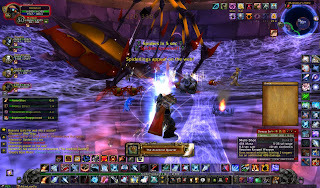 I remember first reading his blog a long time ago when I saw his links from WoW-Insider. He'll be missed from the WoW community at large, but its like hearing about one of my favorite bands breaking up because they want to spend more time with their families (Toad the Wet Sprocket), you can't get upset at them, but rather you look up to them all the more. Hopefully more people will look at their own lives and follow Dan's example and make sure we do not neglect our families, our spouses, and our children. I don't think this means that you have to quit the game, but cutting back and becoming a part-time player for some. For others the only answer is quitting. Some people can be social drinkers others can't. Many of us will miss BRK's wit, humor, darn helpful information, etc. Here's to you BRK, farewell and good luck IRL. Edit: Just wanted to add this link, a request in the forums that BRK be honored in the game somehow. 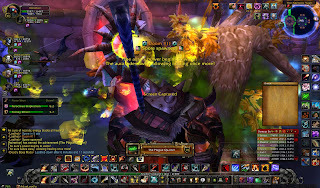 A Casual players perspective on World of Warcraft. Mostly about Hunter related stuff, but to look like an idiot when writing about my alts as well. By the way, my hunter's name "Aoirselvar" is pronounced B-O-B. Lots of silent letters. Hi there, I’m bob. I’m a speech therapist, husband, father of 3, wanna be guitar player, local ward choir director, and part time blog enthusiast (as of August 2010). WoW sites that might be of some interest to you. (I need to update my blog roll sometime soon).